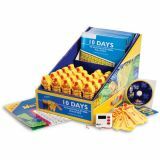 This Class Kit comes with 25 sets of Multiplication Wrap-ups, 25 student workbooks, a Wrap-up Rap Multiply Audio CD, stop watch and a 17" x 22" class recording chart. 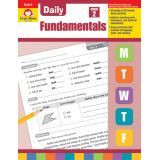 The 64-page student workbook emphasizes conceptual understanding, illustrates commutative properties, and gives meaningful practice with recording charts that show students how much they have learned. 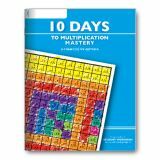 This student workbook contains a conceptual description of Multiplication along with daily activities, worksheets, story problems and recording charts designed to illustrate commutative properties. 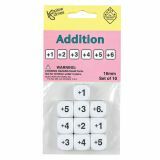 Use with Wrap-ups for an unbeatable combination to learn Multiplication facts FAST! 62 pages. The Addition Wrap-ups come with 10 keys and cover facts from 1+1 to 10+12 and everything in between. Wrap the string from the problem on the left to the answer on the right. Simply turn it over to see if you got it right. The Division Wrap-ups come with 10 keys and cover facts from 1/1 to 120/10 and everything in between. Wrap the string from the problem on the left to the answer on the right. Simply turn it over to see if you got it right. A fun way to improve math fluency! 16mm dice. Set of 3. 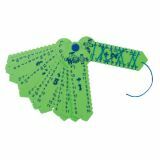 Attract students to the fun of learning addition with this magnetic whiteboard teaching tool. 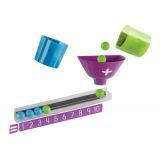 Just place the Addition Machine on any magnetic surface, then use the cups, funnels, and numbered tray to visually demonstrate addition. It's a simple and unique way to enhance your math lessons! Tray measures 11”L. 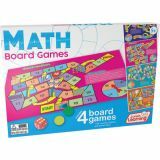 Learn useful math skills while playing these fun board games with your friends. Topics include: Addition, Subtraction, Double or Half and Place Value. Roll the dice, solve the equation and hop on the answer! 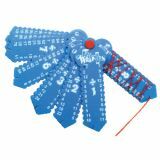 Adds excitement to math practice as kids compete to be the first to answer addition and subtraction equations correctly. 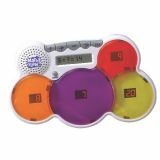 Encourages physical activity in fast paced game play as kids jump, touch or place markers on the answer. 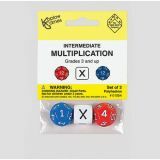 Includes three 5" soft foam dice, 28 cardboard markers and activity guide. 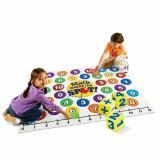 Durable vinyl mat measures 5"L x 4"H. Ages 5-8. Read the question, jam to the beat, scan the possible answers, and slam the one that's correct! Better move quickly, though, each game of 13 questions is timed—the faster you get through the questions, the better your score! Incorrect responses are recycled until they are correctly answered. Three levels, flashing lights, and fun sound effects keep players interested.